There are as many “Leadership Lessons” as there are leaders reading and writing leadership books. We all want to know what will make the difference for our organization. And many of us want to share our hard-won lessons, helping the next leader to avoid wasted time or energy. Suffice to say that there is no single answer, no secret of the universe, no silver bullet that alone makes the difference. Each leader develops their own quiver of beliefs and bon mots that express their approach. While the individual concepts are rarely unique, each specific collection is distilled from the discrete track record of any one leader. This combination of lessons is distinctive to each leader, honed over the specific course of their career. 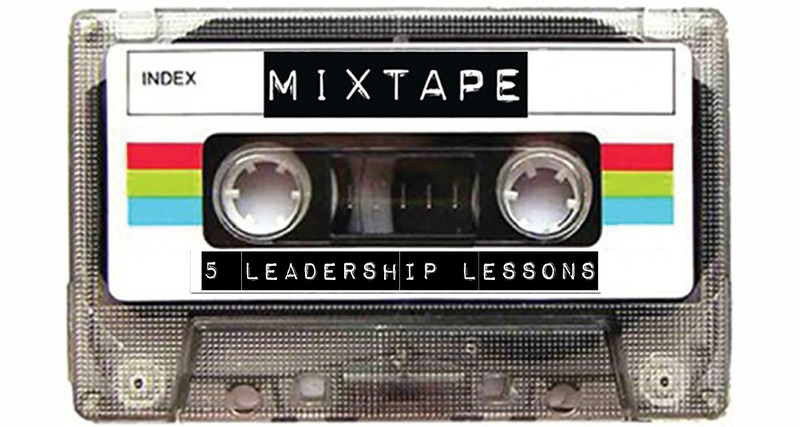 In other words, a leader’s own “mixtape” of leadership. Leaders Eat Last – Servant Leadership builds productivity, loyalty, engagement, and teams. When your team knows you put their interests first, especially if it means you may take a hit, their respect is solidified. Lead from the Front – by demonstrating that company leaders are willing to be first into the breach, you build a staff that will follow its leadership anywhere, including awesome growth. Be the last one out the door, and the first one in. Push a broom, set up a trade show booth, call a customer, take the blame publicly. Fun is as Important as Hard Work – recognizing hard work by blowing off some steam together provides a critical balance to the place we spend most of our days together. When you “let your hair down” your team sees you as a person just like them. All work and no play makes Jacqueline a poor boss. Strength comes from solving hard problems together – teams come together when the collective efforts and skills of the members are used to overcome obstacles, the bigger the better. Camaraderie is born from working in the trenches, shoulder to shoulder – when everyone, including leadership, stays late, comes in on a Sunday, grinds it out, and succeeds, those are the shared stories that make staff the most proud to be part of a team. Changing a culture means changing the way the people think. People won’t change their thinking merely because they’ve been told to. They need to see the folks leading the team demonstrate the changes needed. They need to know they aren’t buying into the “flavor of the month”. Change for the sake of change is tiring and demoralizing. If you demonstrate the change that’s being asked for, if you make it your own, if you stay the course and work through the obstacles, pitfalls and potholes, the team will follow. Some slowly, others with enthusiasm, and others will hold out until the bitter end. Then one morning or meeting, you will see a stalwart hold out reach out to help a team mate. And in the moment, you will know the culture change you seek has taken hold.